Cedar roofing with add visual warmth to your home’s exterior. With natural preservatives that make it resistant to moisture, UV rays, and insect damage, cedar roofing is also wind resistant. Adaptable to tough and varied climatic conditions, cedar is less susceptible to moss growth compared to many other roofing materials. It can be factory treated to be fire-resistant, fungus-resistant, and can be supplemented to be even more moss and insect resistant as well. Cedar wood for roofing produces long, lightweight lengths of timber with fine, straight graining patterns, and a uniform texture. These characteristics make it easy to cut, saw, and nail. For added convenience, hip and ridge units are pre-assembled before shipping, and offer a finishing touch to a cedar roofing project. Cedar roofing also accepts a range of finishes, from fine oils and stains, to solid coatings and paint. This is done most effectively at the mill where such stains and finishes are applied most efficiently. Regarded as one of the world’s toughest woods, cedar is a naturally durable roofing material. A smart investment for your home, it will also enhance the structural strength of your roof. Cedar is a natural insulator, allowing cooler temperatures inside in the summer months and warmth in the winter months. This will help save you money on heating and air conditioning. Along with its practical benefits, cedar roofing offers a natural and timeless look that will enhance the curb appeal of your home. 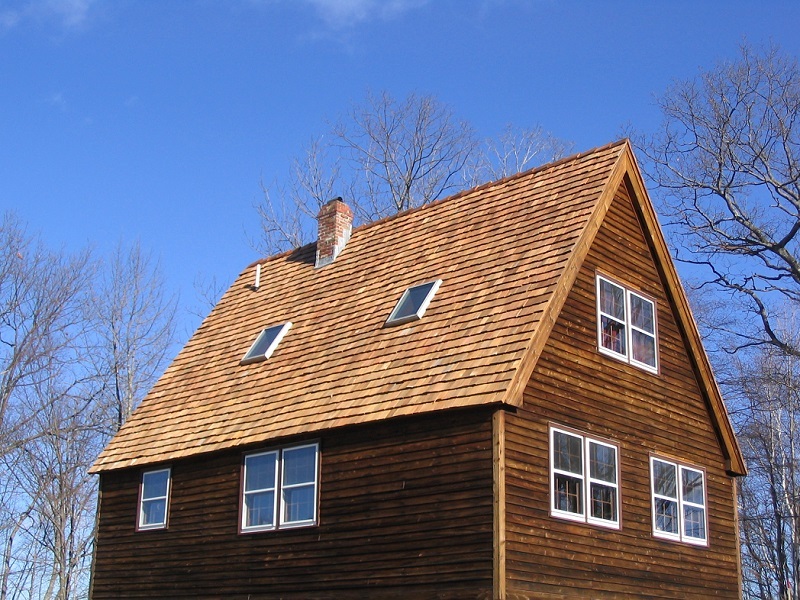 While cedar shingles offer a smooth, tailored look, cedar shakes present a more rustic, rough-hewn appearance. As far as long-term beauty goes, cedar will age to a distinguished looking silvery gray over time. Is cedar roofing the right choice for your roof replacement? Click here to browse our selection of naturally beautiful cedar roofing. Add re-sell value and style to your property.